Check-in is 3pm on the day of arrival. Check-out is 12pm on the day of departure. Does the hotel have car parking? Parking is limited and is on a first come first served basis. If there is no parking available we can redirect you to alternative parking. Breakfast is served between 7am to 10am Monday to Friday and from 7.30am to 10.30am Saturday and Sunday. Maldron Hotel Derry offers free cancellation up to 12 noon day prior to arrival for almost all reservations made on maldronhotels.com or maldronhotelderry.com. Some special offers and key dates may specify a special cancellation policy, these will be clearly outlined in the terms & conditions. Reservations booked via third party websites and online travel agents have their own cancellation policies, please refer to your confirmation email. Are you close to local transport? Yes, Maldron Hotel Derry is within walking distance to the local bus centre, one mile away from Derry-Londonderry Railway Station and five miles away from Derry Airport. Do you have any dining offers? Yes, we have a changing range of different dining offers. Please visit our dining or offers page to view our latest dining offers. We are located inside the historic City Walls of Derry just off Butcher Gate on Butcher Street. How do I manage my booking? All reservations made on maldronhotelderry.com or maldronhotels.com can click here to manage the reservation. Bookings made via third party websites must be cancelled through them. For assistance please contact our reservations team on +44 (0)28 7137 1000. 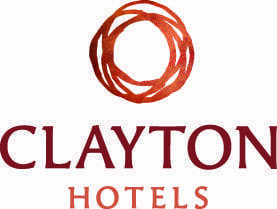 Yes, Maldron Hotel Derry provides its guests with complimentary high-speed Wi-Fi in all public areas and bedrooms. Do you have meeting spaces available? Yes, Maldron Hotel Derry has two meeting rooms available. For prices and availability, please contact us via email at [email protected] or phone +44 (0)28 71 371000. We are a strictly non-smoking hotel. This also includes e-cigarettes. Our family rooms offer a comfortable and spacious stay for families looking to enjoy a break in Derry. 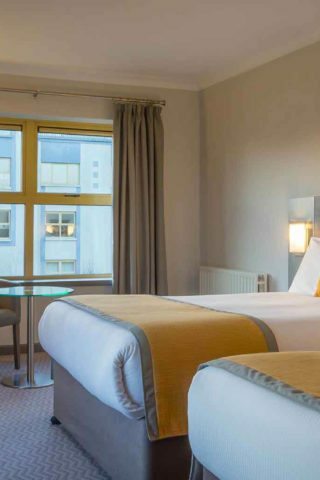 Family rooms at Maldron Hotel Derry boast a comfy queen bed and single bed with crisp white cotton duvets to ensure that all the family have a restful sleep. There is the option of adding in a portable bed or travel cot. Please request when making your reservation. Our family rooms are equipped with a large flat screen TV with freeview, spacious floor area, work desk with lamp, tea/ coffee making facilities and a spacious bathroom with bath and shower. Start your day the right way with our Maldron Vitality breakfast, with a wide selection of nutricious breakfast options to suit all the family.